At what point does an acquaintance become a friend? How and when do you know you can trust someone with your secrets and consider them a confidante? How can you distinguish between friend and foe? What happens when you need to have a friend divorce? 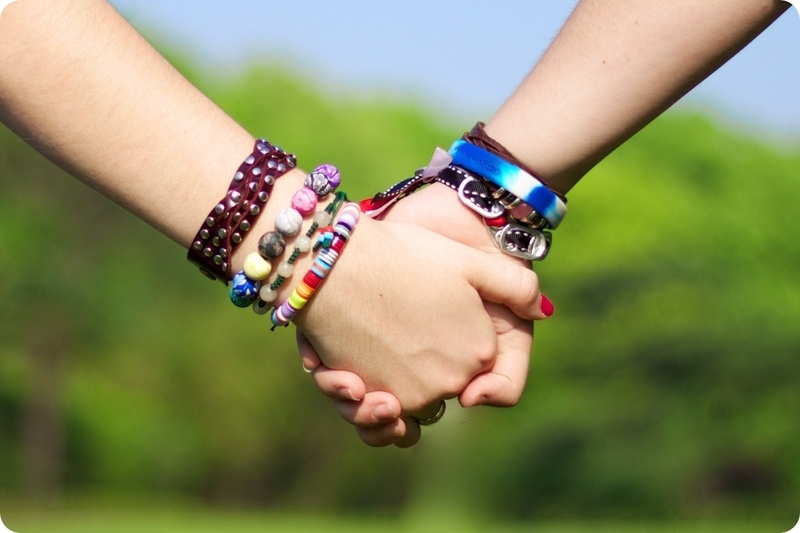 Friendships are so complex and come in so many different varieties, and girls and boys, especially young ones, need to face the truths about friendship, because a lot of them are not so pleasant. Like plants, some friendships require a lot of maintenance, and others don’t. Some delicate flowers need to be nurtured and watered every day in order to grow. Others, like cacti, don’t need much upkeep and will always be there standing strong to weather the storm with you. If you give off bad vibes, guess what kind of friends you’re going to get in return? Bad Friends. It’s as simple as getting what you give. Take a look at yourself and decide what kind of energy you’re putting out and what you want back from the world. It sounds like a load of hippie crap, but it isn’t. As you get older, it’s more likely for you to find people who you get on with better. You get to choose who to keep and who to leave behind and don’t just go for certain friendships based on availability. You will outgrow some friends, this first harsh truth about friendship. As you move through different stages of life, some friends will come along with you, and some won’t. Some friends you may have to leave behind in order to make room for new ones. And as you make new friends, some of your old friends will outgrow you too. It’s just a fact of life. Most friendships aren’t forever, but friends come and go as your life changes. Sometimes more devastating than a romantic breakup is a best friend breakup. As silly as it sounds, it’s hard to imagine if you haven’t experienced it yet. But it will probably happen, and oh boy, it will hurt. But you’ll be alright, as always because life goes on. Learn how to be your own best friend, because the best kind of love is self-love. You know what they say about romance, “no one can love you if you don’t love yourself,” and that’s the truth about friendship as well. Sometimes in life, you may feel like you are all you’ve got, so you’d best get used to loving yourself. No friendship is perfect. Healthy relationships are based on honesty. You have to be comfortable about speaking up how you feel without the fear of ruining your friendship. Tough talks and difficult moments build stronger foundations for your friendship and equip you to face tougher times down the line. There is an ebb and flow to friendships. Sometimes your friend is busy or becomes more focused on other relationships and this may hurt, but it doesn’t mean your friend doesn’t love you any more. Don’t take it personally. Actually, taking things personally will probably make things worse than you think they are. Try not to be so paranoid. Being left out or excluded is normal, and especially in a trio of friends. Between a trio of friends, each one has a special bond to another, and that doesn’t always include you. Sometimes your friends are more successful than you, just like sometimes you might be more successful as well. Just remember that jealousy is an ugly feeling that won’t make anything better. Not all friendships are two way streets, and it can be totally heartbreaking once you figure it out. Like any other relationship built on love, friendships require efforts on both parties for it to work out. Set those who don’t return your love free and never look back. Old friends are special and worth keeping around, even if as you grow you have less in common. These are the friends who have seen you through different phases of your own life, and serve as a kind of mirror to your past. Maintain your perspective by nourishing these relationships. Everyone moves through different stages of life at different times. Maybe your best friend from high school is already married and expecting her first baby and you can barely keep a boyfriend around for more than a few weeks. It’s okay, and most importantly, it’s up to you whether this becomes an obstacle in your relationship. Social networks work like this: single girls and guys hang out with other single girls and guys, and couples, well… you guessed it, couples hang out with couples. This doesn’t mean that your coupled up friends aren’t your friends anymore; it’s just the way social circles go. Even your very best friend will be able to find a close friendship in someone else. Just like you will also be able to find a close friendship in someone else too. The hard truth about friendship is that not all friendships last forever in the same closeness you may experience at a previous time. It’s important to understand the difference between friends you hang out and party with and the friends you can call in the middle of the night in a crisis. Cherish both of these friendships, because both are important for your sanity and safety, but understand the difference. When it comes to friendships, always go for quality over quantity. It’s always better to have just a couple of really solid, strong friendships than to have a slew of people who wouldn’t be there for you in your times of need. Before you can have a good friend, you need to learn how to be a good friend. Only then will you deserve good hearted, trustworthy, reliable friendships. If you are a good friend material, then for sure you will find true friendships anywhere you find yourself in the world. Since most friendships aren’t forever, as we would all like them to be, you have to learn how to let go of friendships that no longer serve you. Trust the flow of friendship and don’t try to fight it, and don’t let it upset you so much.